When I was in San Diego staying with my kids, my daughter-in-law, Trish, had a diffuser. She has all kinds of oils that she uses for various things - they seem to help different aliments, moods, etc. I had heard of diffusers, but hadn't seen one in action. I was still getting over my flu - which I now think was bronchitis. I was feeling great, but had this dumb little cough that I couldn't seem to get over. I mentioned it to Trish, and she got out her diffuser and put the correct essential oil into the water and turned it on. I realized the next day that I hadn't coughed since the previous day: the night before - no coughing, and the next day - no coughing. There must be something to these essential oils other than smelling good. Which, actually, would be enough for me, but the healing properties of the scented air wafting around the room is an added bonus. I told her I was going to buy a diffuser, and she gifted me with my favorite of all my oils. (Not that many really, I still want a few more.) The one she gave me is Christmas Spirit, by Young Living. It smells SO GOOD! The thing that was different about this one is the space where you can put some soil and little plants. I saw photos where people had small live plants, grass, etc. growing, and that was my plan. But then I thought, I'm in the high desert, really dry air, very small planting area. I'd be watering it all the time, trimming it, and having to be SO careful that I didn't knock it over. As I was walking through Walmart, I noticed the faux succulents they had for sale - $1.98 each. Four of those and another plant stem with little white flowers that I cut up to add in between and a bag of pretty rocks, and waa-laa! These are my current crop of essential oils: Tea Tree, Rosemary, Eucalyptus, (all blended with Coconut Oil), Sweet Orange, Lavender, Frankincense, Breathe Easy (Eucalyptus, Basil, Tee Tree and Peppermint blend), and the middle one in the photo is the Christmas Spirit which is an Orange, Cinnamon and Black Spruce blend. Mine - this model - has buttons on the front that you press for how long you want it to run - one hour, three hours, or six hours. There's also a lighted area around the diffuser - see the white line above? Well, with different buttons pushed you can have white, red, blue green purple, or yellow in that lighted area when it's turned on. It's easy to fill, easy to clean, and really cool to use. I turn it on first thing every morning and six hours later, fill it again, and then maybe again till bedtime. I love the different scents diffusing through The Palms. 1. My cough went away. 2. I was working on a project and couldn't settle down and DO it. I researched, and futzed around, read information, copied it into folders on the laptop for future reference, then researched more. This went on for DAYS. Then I thought: I wonder if there's an essential oil to help with concentration. I looked it up and - Yes! Frankincense helps to Stay Focused, Centered and Relaxed! So I bought some - came back home, added a few drops to the water in the diffuser, sat down and finished my project. Ha! It worked! Was I playing mind games with myself? Who cares? Whatever caused me to sit down and get the project done, mind games or essential oils, the project got done. So, that's my new thing. I can't really call it a toy or an RV mod, but it's my new favorite thing and I wanted to tell you about it. NOTE: See my P.S. 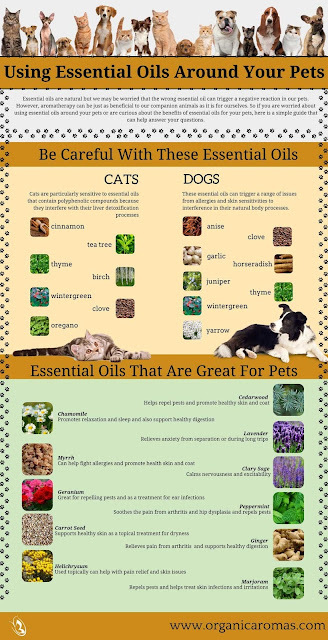 below for info about pets and essential oils. There's never a dull moment with me and my Wonderdog, Katie - some big changes are going on in The Palms lately. I'll tell you about those in the next post. From Me and Katie, have a great weekend, everyone! P.S. My first two comments were about certain essential oils not being good for pets, so I did a bit of research and found a couple of good websites on this subject, and I'm sure there are more. It turns out some essential oils are NOT good for pets, while others are BENEFICIAL. Thank you, Ruth! 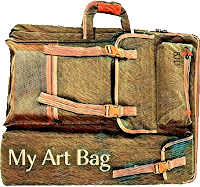 I sure appreciate your comment and did add a note to the blog as well as a couple of other links. Good information! FYI - sone essential oils are toxic to dogs so you need to check that out before you buy any. There are also some like lavender and spearmint that can be good for pups. Give Wonderdog a smooch from Rocky. Hey, Sandie - so grateful you gave me a heads up on this - I did have two that are on the "bad for dogs" list, so I put them away, and all the rest seem to be good. 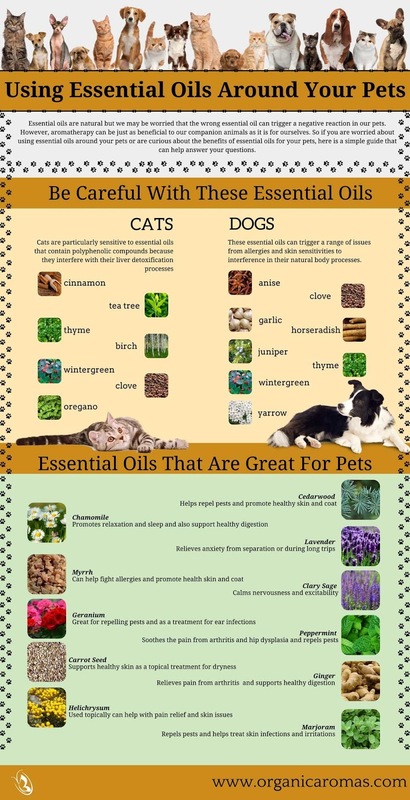 I also made a list of the oils that are beneficial for dogs, and am going to buy and use those the most. Poor little Katie, she needs all the help she can get! Glad someone gave you those heads ups and you did more research. Don't want to be loosing part of your team. I am like you - not completely sure about them but they smell so good and if they work - it's a Win! WIN!! I like rosemary and also Thieves....it's supposed to help with breathing and Louis Dean has asthma. Your diffuser is adorable. I am going to follow your link and get one! Mine is plain Jane but it's in the bedroom. I'll use the new one elsewhere. What a wonderful addition to your lifestyle. Hey if it works for you that is wonderful nothing like putting some scents into your lifestyle. Actually I think the diffusers work great with just water. And yes, please be careful with essential oils and pets. Tea tree oil in particular is a killer. Very cool. I've always wondered how the diffusers affect pets. Thank you for posting the essential oils you can use, and not use around pets. This will be very helpful for a lot of people. After reading your blog, will have to look into this and try some different oils... thanx!! That's nice to know which oils aren't good for pets! I love diffusers and the natural oils an so does my husband. He was running his all the time in his upstairs office at our house and I would run mine at night. Wonderful. The house smelled so good and I was breathing so much easier. However! I began to notice a film on the windows and one day I looked at the bedroom wall and it had patches of weird dust which I realized later was because of the oil the diffuser was putting in the air. So enjoy the diffuser but maybe don't run it all the time like we used to so your RV doesn't get all filmy from the oil. We still love ours and use it but not all the time anymore. Hi sg smith! I appreciated your comment and info, and have made a few adjustments. I love having the diffuser going all the time, and I'm pretty much still doing that, but I've reduced the amount of drops of oil I'm using. I was using around 4 drops with each water replacement before, at first it was hard to figure out how fast/slow the oil was dripping out. But I think I've got it now, and it's easier to get two drops. Thanks for the post about the oils and diffuser along with the image. With a cough I cannot get rid of after two weeks I am motivated enough to buy the diffuser and try the oils. I didn't see which oil you used for getting rid of your cough. I'll find it in my research hopefully. Thanks for the post. Hi! How are you and Katie doing? Enjoy hearing about your travels. Hi Barb, just wanted to let you know I'm still following you on occasion. I am now located in a park model in Mission Texas and loving it. If you ever make south Texas be sure and give me a holler. Thank you for your comments - we LOVE them!